The Imitation Game is now showing in Australian cinemas and is distributed by Roadshow Films. Now showing in the United States and United Kingdom. With an incredibly strong cast and screenplay, The Imitation Game is an extremely solid and highly enjoyable film. Looking at the relatively recent discovery of how Alan Turing and his associates came to play a major part in ending World War II, it is Benedict Cumberbatch who is at the centre of the film and truly makes it a memorable experience with his incredible performance. 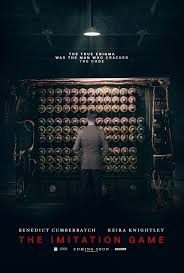 In 1939 Great Britain, war has just been declared and one of the country's greatest mathematical minds, Alan Turing (Benedict Cumberbatch) has just been employed by the government to help crack the code of the German's encryption device, Enigma. As Enigma's code resets each day, it is an extremely difficult talk and a race against time, but to break it would bring about the end of the war. A team of great minds are assembled alongside Alan to try to solve Enigma, including champion chess player, Hugh Alexander (Matthew Goode) and Joan Clarke (Keira Knightley). In order to do this, Alan builds his own machine to work against the Germans, a decision that is not made without criticism from those around him. However, if Alan can get the machine (which he has affectionately called Christopher) to crack Enigma's code, it would be the greatest weapon against the enemy and would once again bring peace to the world. The story of Alan Turing is not only intriguing, but one which everyone should hear in order to understand that it wasn't the weapons on the battlefield that ultimately made a difference. Some of the greatest minds worked in top secret conditions to bring peace to the world. As this part of history was kept a government secret for over 50 years, this story has not been told on the screen before and brings a new understanding to the quest for peace in the war years. The Imitation Game is a truly unique experience for this reason and it's screenplay does the story of Alan Turing's life and most important achievement complete justice. As well as chronicling the war days, flashbacks to Alan's childhood are used to connect the viewer to and understand the character of Alan further. The screenplay is exceptionally well written and the dialogue very witty and surprisingly hilarious at times. As Alan Turing wasn't particularly sociable, he suffered from a lack of personal skills and his honesty and reactions to certain aspects of human behaviour and speech are highly amusing. The film isn't continuously suspenseful, but rather has bursts of tension. These moments are actually quite eerie, as one can feel the tension of the characters on screen trying to work against time to solve the code and prevent the war continuing with thousands of lives being lost. They are connected to the war and although they are working far away from it, in the moments of silence at the end of the day you can somehow hear the sounds on the battlefield far away. The film is quite moving at times, but it is the story which is most powerful. 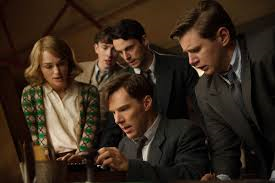 With the majority of The Imitation Game being set in 1939-1942, the film is incredibly nostalgic. The costumes and production design are perfect for the time period, but the attitudes captured are also time relevant. Being female, Joan is always the outsider of the group and although she is in fact a woman quite ahead of her time, the way everyone around her see's her is perfectly suited to the time period. While the screenplay is brilliant, it is Benedict Cumberbatch that The Imitation Game will most be remembered for. Cumberbatch is absolutely brilliant as the quirky genius. He channels Turing wonderfully and gives an incredibly controlled performance. He delivers his comedic lines perfectly and is able to become likable to the viewer while behaving hostile, but he also plays the damaged Alan so well. It is a role which shows Cumberbatch's versatility as an actor as he shows the many sides of Alan with such conviction. Although none of the other characters in the film are really given a great deal of background or development, the rest of the cast all have strong screen presences and work perfectly alongside Cumberbatch. Keira Knightley is wonderful as Joan Clarke in a performance which is also controlled and strong without being forced. Charles Dance, Mark Strong and Matthew Goode all have tremendous screen presence and also do very well. The Imitation Game is a unique story which is not widely known, but one that should be. Benedict Cumberbatch proves his incredible versatility as an actor and ultimately carries the film to the success that it is.